The crucifixion of Jesus is easily the most depicted event in human history. 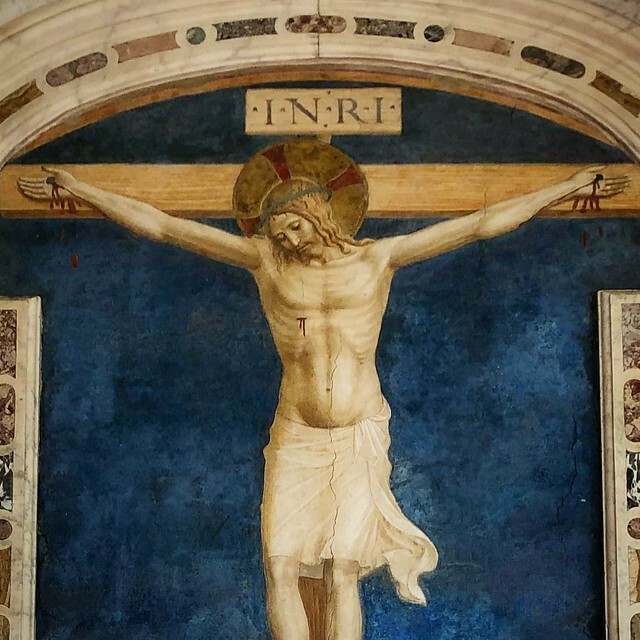 How many billions of crucifixes have been formed, fashioned, carved, and painted over the past two millennia? And yet what is it that is being depicted in these billions of crucifixes? On a purely objective level, it is the torture and murder of an innocent man at the hands of those who run the world by the means of violent power. The crucifixion is the damning indictment of the world as it has been arranged. What the cross tells us is that when the Son of God entered our world — the world created by Cain and all the kings who followed in his bloody wake — our systems of violent empire and sacrificial religion nailed him to a tree. This is the moment when the principalities and powers who run the world were put to open shame, and their claim of being wise and just was shown to be nothing but an empty sham. What they called wisdom and justice was nothing more than a cheap disguise to hide their naked lust for wealth and power. Paul says the rulers and authorities were shamed by the triumphant truth-telling of the cross. Every crucifix reminds us that our systems of civilization built around an axis of power enforced by violence are not to be trusted. The myths, monuments, anthems, and memorials of every empire are designed to cleverly hide the bodies of the weak who have been trodden down by the mighty in their march to “greatness.” The cross is the unveiling. The cross is the great truth-telling. The cross is the guilty verdict handed down upon empire. The cross is the eternal monument to the Unknown Victim. Yes, the cross is where the world is forgiven, but not before the world is found guilty. But trite and tidy answers about the meaning of Good Friday are how we domesticate the cross. This is the bane of atonement theories. Instead of the crucifixion remaining the pivotal event in a compelling story, it’s turned into a sterile formula. The cross is diminished to one of the Four Spiritual Laws or a waypoint on the Roman Road. This is how the cross is sanitized and made mechanical. The storyline is lost and the scandal is swept aside. I’m not sure why Protestants abandoned crucifixes for empty crosses, but I think it was a mistake. I know that Protestants often argue that Jesus didn’t remain on the cross, but he didn’t remain in the manger either, and Protestants don’t seem to have an objection to Nativity scenes. The truth is, Jesus was crucified and this is the epicenter of the gospel. Paul tells the Galatians, “It was before your eyes that Jesus Christ was publicly portrayed as crucified.” A crucifix replaced with an abstract symbol removes the crucifixion from the story and seems to indicate a move to reduce the cross to a kind of mathematical sign or theological equation. This gives rise to pallid descriptions of the cross like, “God turning our minus into a plus.” Once we do that we can easily lose sight of the scandal of the cross. And the cross is a scandal! For Christians living at such a far remove from the first century, the depth of this scandal may be hard to grasp, but your hero being crucified would be the last thing a Jew or a Roman living in antiquity would boast about. Yet the early Christians did boast about it. Paul readily admitted that this was foolishness to Romans and offensive to Jews. But Paul also said it was the power and wisdom of God, contending that “God’s weakness is stronger than human strength.” Paul doesn’t mean that when God is weak, God is still stronger than humans. That wouldn’t be scandalous, that would be just a typical boast about conventional power. Rather Paul is saying that God’s power is weakness! Think about that for a moment and you will realize that such an assertion is still scandalous today. We are fascinated by conventional power — power to purchase, power to enforce our will, power to kill — and we are put off by any form of powerlessness. But it is precisely the powerlessness of God enacted by Jesus on the cross that somehow saves the world. Look long and deeply at the cross and you may catch a glimpse of the greatest mystery of all. Today, about an hour before I saw Fra Angelico’s Crucifixion, I saw Michelangelo’s David. No doubt Michelangelo’s marble masterpiece is impressive and the crowds who stood around it taking pictures knew it was a monumental artistic achievement — the iconic embodiment of the Renaissance. But what moved me most today was standing alone before a monk’s fresco painted above a humble door in a medieval monastery. David impresses me, but the Crucifixion saves me. 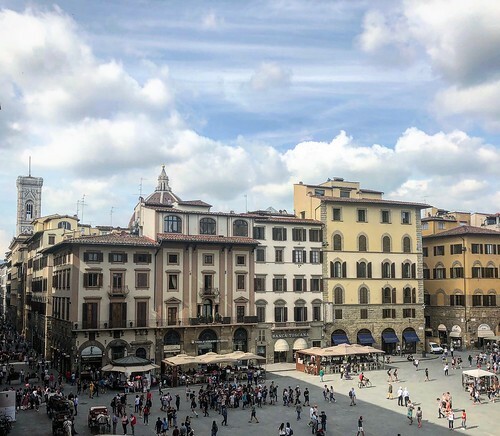 Anyway, these are my thoughts on a beautiful afternoon in Florence. View from the room where I wrote this blog.